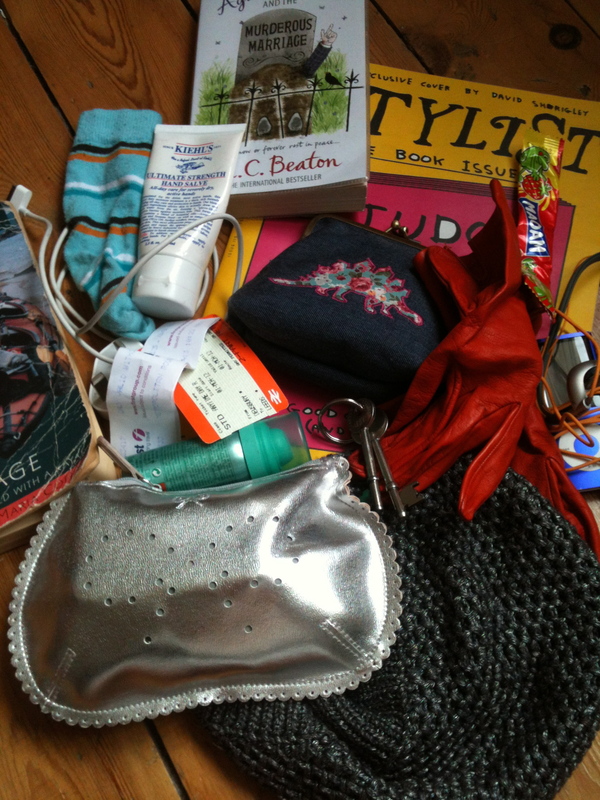 Handbag Contents: What does a blogger carry? I’ve seen quite a few of these posts over the years. The bag contents of bloggers are neatly laid out for us all to peruse and everything is chic, well designed and organised. So, feeling a bit inspired by this, I thought I might have a go myself. The bag I carry around everyday is my beloved Mulberry Antony. The large version of this is big enough for a book or magazine, and even though I am notorious for over-filling bags to breaking point, it seems to absorb all my rubbish very well. Plus, and very importantly for me, it leaves my hands free for catching wayward toddlers before they step off the nearest ledge, hailing buses, messing about with Iphone apps or reading a book. The only thing you can’t see here is my iPhone because that’s what I used to take the photo, but believe me, it’s there ALL the time. iLimb, as my lovely friend calls it. In amongst the jumble and ignoring the old bus tickets, there are things that I’ll point out. My lovely dinosaur purse from Sew You. This week’s edition of Stylist magazine. I adore Stylist magazine and the daily Emerald Street email they send out too. Kiehl’s Ultimate Strength Hand Salve. As someone who is often changing nappies, cooking or gardening, I wash my hands a lot, so they get sore. I’m really wary of having old lady hands so am obsessed with great hand cream. One small sock. Probably the sole survivor of a pair. I have no idea why it is in my bag, but it’s the kind of thing I’m likely to be carrying around. To be honest, I’m surprised there isn’t a toy car in here. A giant chewy sweet, taken from my son who decided it was perfect breakfast food. We disagreed. I may eat this to save him from the tooth decay. My beloved orange leather gloves bought in Florence, Italy. I love orange but this is the closest I get to wearing it, as it doesn’t really suit my skin tone. Two books. This is why the bloody bag is so heavy! One of these is my library book. I’m reading through all the Agatha Raisin murder-mystery series at the moment. They’re very engaging and so easy to read. The second book is called ‘A Boat in Our Baggage’ by Maria Coffey, which I’ve borrowed in preparation for my Epic Kayaking Adventure in the Lake District. Which is really a little paddle, but in my head is now ‘Swallows and Amazons’ (and before you say it, I know they didn’t kayak!) so I need the inspiration. The silver bag is my Emergency Pouch. I recommend one of these. Inside this I keep painkillers and other medications, things that women need (you know…) spare contact lenses, lipstick, and for some reason, earrings. Never had an earring emergency but it could happen. Having it all in the pouch (and remembering to replace stuff you’ve used) means you can just take it all out of one bag at once and drop into another. Handy. 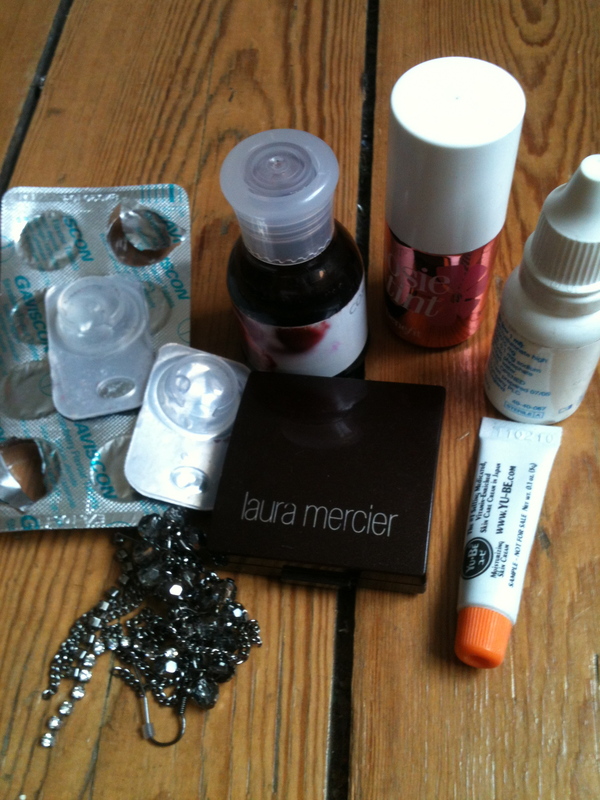 In the emergency pouch are also two make up saviours: Posie Tint by Benefit and Laura Mercier cheek cream in ‘Canyon’. If I’m looking for a bright, but light way of freshening up my face, I use the Posie Tint on my cheeks and lips. I love the Benefit stains, as they just don’t wear off. If I’m after a simpler but healthy look, I’ll use a bit of the cheek cream instead. It’s a great light terracotta type colour that seems to suit everyone and just gives me a healthy glow. So, this what I carry around. Alongside this is usually a small notebook and pen too, in case I need to remember something. As an inveterate list writer, this is essential, although I’ve started to use the notes function on my phone more often. One thing you can’t see here is a giant DSLR camera. That’s because I don’t have one. There is a plan afoot though, so hopefully one day soon you’ll see better photos on the site! 9 Responses to Handbag Contents: What does a blogger carry? LOVE seeing the contents of other people’s bags… great post. In mine – work diary (massive day-a-page Sherwoods monster), purse, keys, notebook and pen, Cath Kidston make up bag with lip balm, breath spray and a little mirror inside it. Migraine tablets, work ID badge. I love seeing these posts, and peeking into peoples bags when they are not looking! I carry far too much in my bag, most of it I don’t even use yet it gets transfered from one bag to another. I did one of these posts ages ago, must schedule another one soon! this was a lovely read! It brought back memories of when my kids were smaller, and the additional paraphernalia that that involved – the sock was a particular favourite! I surprised myself when I reviewed the contents of mine – I am a handbag minimalist: purse (fairly huge purse though, stuffed full of ancient receipts and reward cards from every coffee place imaginable), pens, my Kindle, paracetemol and major painkillers for my back, notebook, an amazing amount of perfume samples and several lipsticks and lipgloss, and of course a tube of Elizabeth Arden 8 hour cream – which I swear by! thank you for helping me idle away an interesting half an hour. On it is my nurses’ style fob watch, and inside is:my Android phone, my Ogon RFID wallet containing a variety of cards, the camera I took the photos with! Other things are a 4Gb mini USB key clip, painkillers, handwipes tissues, tape measure, elastoplast, ring sizing gauge, hairgrips, schedule for The Barre, in case I fancy going to an extra class, a calling card holder which contains stamps and some other things as well as calling cards for me & some Charis Victoria cards. My keychain which is attached to the bag has on it a Utili-Key, a Cash-Stash for emergency money, another USB stick and a Nite Glowring from Firebox so I can see what’s in my bag in the dark! What else… a crystal-style nail file (much better than emery boards, I think) Paperchase notebook, one of my fountain pens and a gel-pen, some handcream, drawstring coin pouch, an embroidered cotton fan, a little pouch containing my smelling salts, some safety pins and a sample sized pot of Body Shop’s hemp hand cream (great when my hands a really dry) and another pouch containing my smallest set of Poi, because I never know when the fancy will take me to have a spin. Oh my, what a lot of junk I carry around with me! There is also room for a book, but I’m currently between reads, and deciding which one to go for next from my ever-growing ‘to read’ pile, which currently stands at about 100 books! I think quite a lot of the stuff you carry around does seem useful though – you’d be a good person to have around in an emergency! I took a photo of the contents of my handbag last summer, but it was a bit misleading as I’d only been using the bag a few days so there were no random items yet. I’ll probably do another soon as part of a blogpost about my MiaTui bags. I too have a fondness for the Benefit tints. My current fave is Cha Cha Tint, but I still use Benetint and Posie Tint too. I like the fact that they stay looking good for hours and you don’t have to keep reapplying them. Ooh, i tried the Cha Cha tint the other day, and it is definitely on my list of things to buy. Really great flattering colour. I look forward to a bag contents post from you too! Taking Part: Why Twitter has changed my life.